On May 24, 1926 (Taisho 15), the pioneer farming villages of Kami-Furano and Biei in central Hokkaido were nearly destroyed when Mt.Tokachi erupted, causing a river of boulders and melting snow to sweep through the valley and decimate nearly everything in its path-- including 144 lives. Fifty years after the eruption, in 1975, Miura Ayako went to Kami-Furano to interview the survivors of the disaster and to hear of the incredible hardships they were forced to bear in order to rebuild their lives. In 1976, the Hokkaido Shinbun newspaper began to serialize Deiryuu Chitai (Mud flow zone), Miura's novel about the Mt.Tokachi disaster. It is one of her most powerful works, and I think I am more eager to see it get published in English translation than just about any of her other novels. Starting this month, the tenth anniversary of Miura's death, and going till March 2010, the Miura Ayako Literature Museum in Asahikawa will be holding a Special Exhibit on "The Making of the Novel: Deiryuu Chitai." Miura's field notes and interview records will be on display, along with documents, news reports, and photographs related to the Mt. 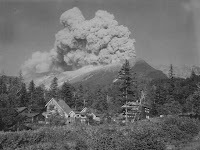 Tokachi eruption. If you are fortunate enough to be in Asahikawa between now and next March, be sure to take in the Deiryuu Chitai exhibit. And if that is not possible, check out the Deiryuu Chitai summary and sample chapter that are posted on the World of Miura Ayako homepage.